It seems that everyone wants to challenge the Northern fur seals! After seeing some staff members and supporters go toe to flipper with Isaac, Cordova and Ursula in some Fitness Friday challenges, several of our VPs and our president and CEO decided to get in on the action. 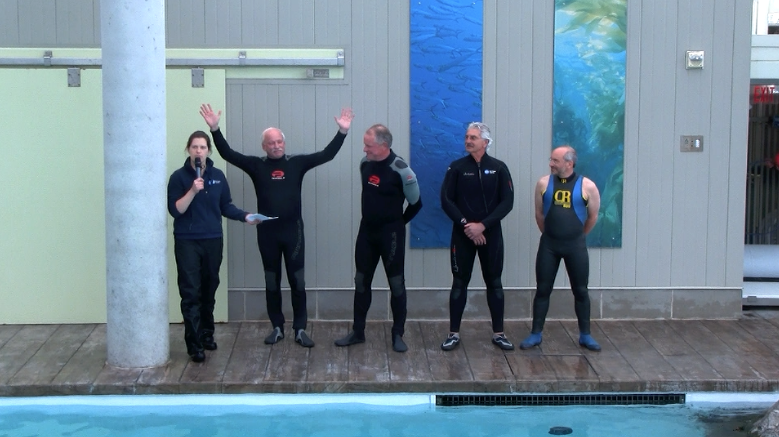 Our President and CEO, Bud Ris, battled Isaac to see who could beautify the water in the New Balance Marine Mammal Center faster by pulling more toys out of the water and placing them on the deck. Patty introduces (left to right) Bud Ris; Walter Flaherty, Executive Vice President and COO; Joe Zani, Vice President of Finance and Operations; and Billy Spitzer,Vice President of Planning, Programs and Exhibits. Although Bud did his best to distract Isaac with his splashy dive into the pool, he was hampered by having to wear a bulky wetsuit. Isaac, on the other hand, has the advantage of his sleek fur, which allows him to glide through the water. Watch the video below to see who won. As you can see, the fur seals and sea lions in the New Balance Foundation Marine Mammal Center are inspiring athletes. Get inspired for your upcoming weekend and learn more about these active marine mammals by looking back at some previous Fitness Friday posts: Compare "landlubbing" harbor seals and fur seals. Ever wonder how well a sea lion plays soccer? Wonder no more. Check out Isaac's feats of strength in this post about learning new skills.